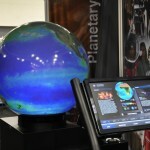 Global Imagination’s Magic Planet VR Sphere is an exciting new way to create a shared public experience for 360⁰ content – it presents Virtual Reality (VR) media in group settings without the need for goggles. 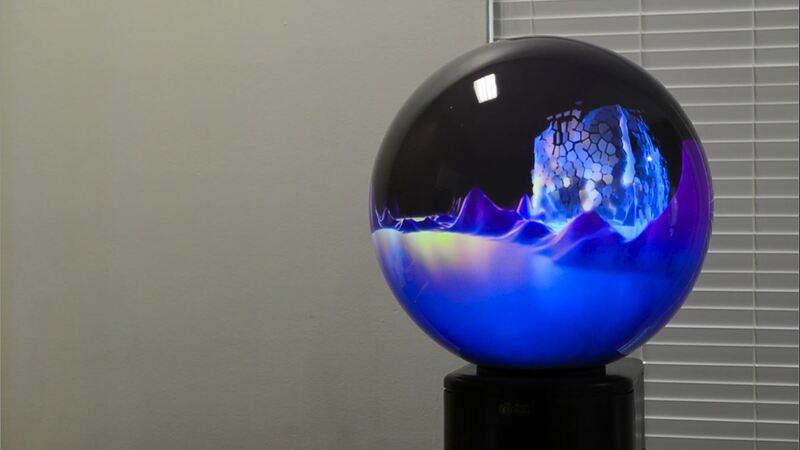 The VR Sphere is a spherical display with all the software you need to present your VR content as a compelling, touch-interactive, 360⁰ encounter. The VR Sphere will engage and connect both interested parties and people merely passing by with your compelling VR experience. The VR Sphere is also an excellent tool for creating VR content more effectively. When producing 360⁰ VR experiences, you either work with distorted, 2D rectangular media, which makes understanding the scenes difficult, or individually don goggles, which makes collaborative production difficult. The VR Sphere’s projector and lens eliminate the distortion of rectangular source video, and let 360⁰ content creators interact while viewing the entire landscape without goggles. The VR sphere provides a complete 360⁰ visualization of the content all at once for everybody to see, so you can create a better user experience more effectively and efficiently than ever before. A wide variety of projection options from 3,000 to 25,000 lumens, 2K, 4K or 6K resolution, laser, etc. Interactivity options including touch (on select models), 3D navigation, kiosks, etc. Your choice of “player”, including computer, digital signage player, etc. ​With our Platform, you can play your existing 360 media right out of the box, leveraging and repurposing it to reach the “non-headset demographic”. That said, whether you want to: optimize your media for the sphere; create new media; or develop MR experiences, we have a range of studio partners to help – or we’ll gladly work with your favorite studio who already understands your creative needs and process. ​Our own Studio capability meets a very specific need: many public spaces, such as airports, malls, convention centers, etc. need a way to create ads for all their concessions, tenants, advertisers extremely cost effectively – often to adapt existing 16:9 media, logos, text etc. to the sphere. Our Studio also can do 360 shoots of them all at once, significantly reducing the per-tenant cost, while creating an optimized 360 experience. ​If you’re interested in having a ready-made “entertainment and/or educational experience”, we can provide it. Through our long history in the education market, we have the world’s largest collection of global educational. Our content library included hundreds of “museum experiences” from organizations like NASA, the Smithsonian, the American Museum of Natural History, the European Space Agency, and numerous others. They share their Experiences – many of which only work on our Platform – as part of their public education mission. ​We also have relationships with major VR studios like Jaunt, Littlstar and others, so we can help you get the entertainment content you want for your specific venue’s sphere experience. Or perhaps you want more of a VR/AR gaming experience on your sphere. We can help, just bring your requirements to us. ​Location and venues are adding / must add “experiences” to help draw visitors and compete with the Internet. Our spheres are an ideal option. We offer a complete solution as a service. Not only will we install the platform at all your venues, but also we’ll operate it for you, and even sell advertising time on the sphere to help you monetize it. Think of it like being your own entertainment, education and advertising Network. Selling advertising and sponsored content time on your spheres, using a revenue-share model (you’re welcome to sell “sphere time”, also, of course). we provide an excellent ROI.